Five-star boutique hotel OTRADA is located in the prestigious district of the city, 5 minutes away from the the Black Sea coast. 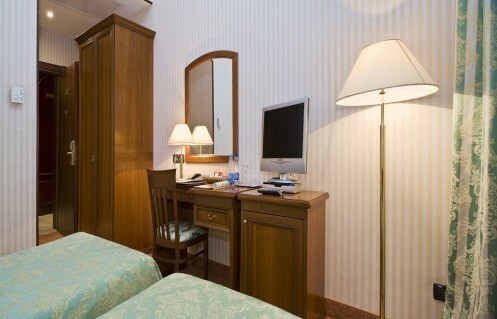 Historical architecture of the hotel combined with modern technology, creating a delicate sense of luxury and comfort. 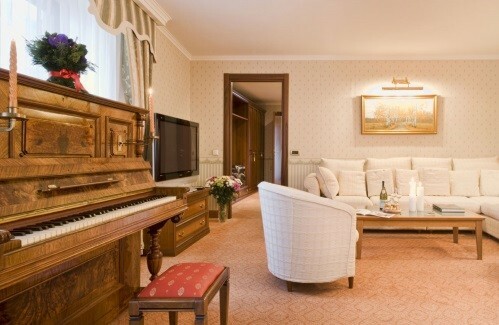 Cozy rooms, Italian furniture, designer decor, fresh flowers and the best service. 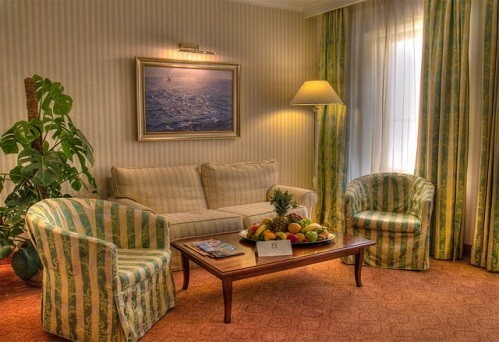 Guests will also appreciate hotel's close location as to the business center of Odessa, and the possibility, to relax at the hotel beach resort or take a walk on the sea boulevard, after business or conference. shuttle bus / transfer services, cars rental of any class, guided tours (with a guide and translator), business center services, tickets reservation (air, train, theaters, museums, cinemas, exhibitions), dining reservation, flowers delivery, fitness center, a beauty salon, sauna, massage service, beachside complex, yachting, family and children's activities, recreation club, assistance in the organization of events, wake up service, interpreter services, express mail, doctor on call. 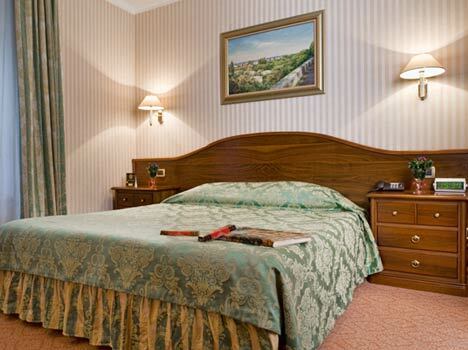 classically decorated, comfort King/Twin - size bed with a backyard view of the hotel. The total area of the room - 15 m2. Maximum occupancy - 2 people. Features: Italian furniture, safe, minibar, climate control system, LCD TV with satellite TV, electronic key system, bathrobe and slippers, hair dryer and bath accessories/toiletries, make-up mirror, desk area, spacious wardrobe, telephone, Wi-Fi Internet. spacious room furnished with elegant furniture overlooking the “internal courtyard” or city view, feature the most comfortable King/Twin sized bed, Italian warm bedspread, two chairs and a coffee table. The total area of the room - 20 m2. Maximum occupancy - 2 people. Features: Italian furniture, safe, minibar, climate control system, LCD TV with satellite TV, electronic key system, bathrobe and slippers, hair dryer and bath accessories/toiletries, make-up mirror, desk area, spacious wardrobe, baby cot on request, telephone, Wi-Fi Internet. each Junior suite room it’s a unique blend of modern convenience and classical charm furnished with elegant furniture, comfortable King/Twin sized bed, Italian warm bedspread, two chairs and a coffee table, overlooking the city view. The Junior suite are fully equipped with the latest technology that would be expected by today’s business traveller, who can take advantage of the desk area and complimentary Wi-Fi available throughout the hotel. The total area of the room - 25 m2. Maximum occupancy - 2 people. Features: Italian furniture, safe, minibar, climate control system, LCD TV with satellite TV, electronic key system, bathrobe and slippers, hair dryer and bath accessories/toiletries, make-up mirror. Luxurious and elegant, each Deluxe Junior Suite is more spacious than Junior Suite and Standard Superior rooms. Exclusive décor and atmosphere, originally-designed luxury marble bathrooms, private balcony with a stunning view on the terrace and swimming pool. Deluxe Junior Suite rooms are ideal for one who wishes to experience a romantic holiday escape in Odessa or is visiting for a business matter. The total area of the room – 28 m2. Maximum occupancy - 2 people. Features: Italian furniture, safe, minibar, climate control system, digital satellite-TV, electronic key system, bathrobe and slippers, hair dryer and bath accessories/toiletries, make-up mirror, desk area, spacious wardrobe, baby cot on request, telephone, Wi-Fi Internet. Exclusively designed Deluxe suite have separate living and sleeping areas, spacious marble bathroom, sofa bed for family occupancy. Guests can enjoy views over the “internal courtyard” rooftops of Odessa. The total area of the room – 33 m2. Maximum occupancy - 2 people.Features: Italian furniture, safe, minibar, climate control system, digital satellite- flat- screen TV, electronic key system, bathrobe and slippers, hair dryer and bath accessories/toiletries, make-up mirror, desk area, spacious wardrobe, baby cot on request, telephone, Wi-Fi Internet. Exclusive Deluxe Apartments offering total privacy and security as well as unrivalled luxury. Apartment is decorated with antique accessories of a bygone era, features a living room and dining area, bedroom, marble bathroom complete with Jacuzzi bath, separate walk-in shower, private terrace, modern amenities including a plasma-screen TV and large mini bar. Deluxe Apartments are perfect for business people and family accommodation. The total area of the room – 60 m2. Maximum occupancy - 2 people. Features: Italian furniture, safe, minibar, climate control system, digital satellite-flat-screen TV, electronic key system, bathrobe and slippers, hair dryer and bath accessories/toiletries, make-up mirror, jacuzzi bath, desk area, spacious wardrobe, baby cot on request, telephone, Wi-Fi Internet.